Cell is lysed; phages are released. 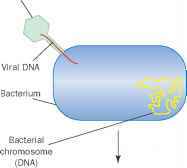 In transduction, a virus inserts its genetic material into a bacterial cell, as shown, but then integrates it into the bacterial chromosome. When the viral DNA leaves the bacterial chromosome, it may take one or more bacterial genes with it, packaging them into viral protein coats in which they are released from the cell. use the transcription and translation mechanisms of the host cell to express viral genes. Viral genes are expressed in a specific order. First, the genes needed to hijack host cell metabolism are expressed. Next, the viral genetic information is copied many times. The third step involves transcription and translation of viral genes for protein components. The fourth step requires the insertion of viral DNA into the capsid, the protein shell of the virus. Finally, the virus expresses genes needed to break open the host cell, releasing hundreds of new viral particles that move on to infect new host cells. Among the best studied of the generalized transducing viruses is P22, a virus of the bacterium Salmonella choleraesuis (subspp. typhimurium). In the course of its normal life cycle, the virus binds to a specific receptor on the surface of the bacterial cell, injects the viral DNA into the host cell, and begins to express viral genes. The ends of the viral DNA are redundant; that is, they have small sections in which the genetic information is duplicated. The DNA repair enzymes of the host cell joins these ends so that the viral DNA forms a circle of double-stranded DNA. A DNA nuclease enzyme then makes a nick in one of the strands of DNA. The unbroken strand then serves as a template, allowing the broken strand to extend itself. This forms a long stretch of DNA that repeats the genome of the virus many times. The long repeating sequence of DNA is known as a concatamer. The genes for viral capsid proteins (the proteins that make up the coat of the virus) are then expressed, and empty viral capsids are produced. Next, a viral DNA-cutting enzyme cuts the concatamer of DNA at a specific sequence. Once the concatamer is cut, the end of the DNA is pushed into an empty viral capsid until the viral head is full. A new empty capsid then positions itself on the end of the concatamer and the process is repeated until all the viral DNA is packaged. Generalized transduction occurs when the enzyme that normally cuts the concatamer cuts the host chromosome instead. The viral capsids cannot distinguish viral DNA from host DNA; thus, once the initial cut is made, the empty capsids are filled with host chromosomal DNA instead of viral DNA. Since each empty capsid picks up where the last ended, it is possible for all the genes on the host chromosome to be packaged at similar rates: thus, this process is generalized. When the host cell breaks open, the viral capsids containing host chromosomal DNA, now called transducing particles, are able to bind to a new host cell. The DNA they carry is injected into the new host, but since there are no viral genes included on the injected DNA, the newly infected host cell is not killed. If the original host cell (the donor) was genetically different from the new host cell (the recipient), the DNA recombination enzymes of the recipient cell will insert the new genes in place of the old, thus altering its own genetic makeup. 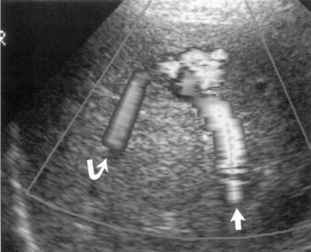 This genetic change is integrated into the recipient genome and is passed on to future progeny cells.